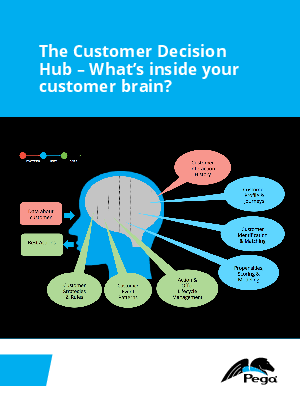 > Pega > The Customer Decision Hub – What’s inside your customer brain? Customers today expect companies to either “just get it” or get lost. The new normal for consumers is being able to do business on their terms, with companies that have products that are easy to discover, easy to use, and are personalized and relevant to them. Not to mention they must be offered at a great price and available in any channel, be reliable and come with outstanding omnichannel – Mom & Pop-like service and support. In other words, they want to have their cake and to eat it too!